Edward Palmer was a relatively minor figure in microscopy. He operated a natural philosophy (i.e. scientific) shop in London during the 1830s-40s. He was probably the master with whom William Henry Thornthwaite served his apprenticeship (Thornthwaite later formed the optics company of Horne, Thornthwaite and Wood). But Palmer is included in this series of biographical essays because he issued an extensive catalog of his wares in 1840, which is presently the earliest identified, freely-accessible sales catalog of microscopical apparatus (available from Google Books, and from links on this web site). 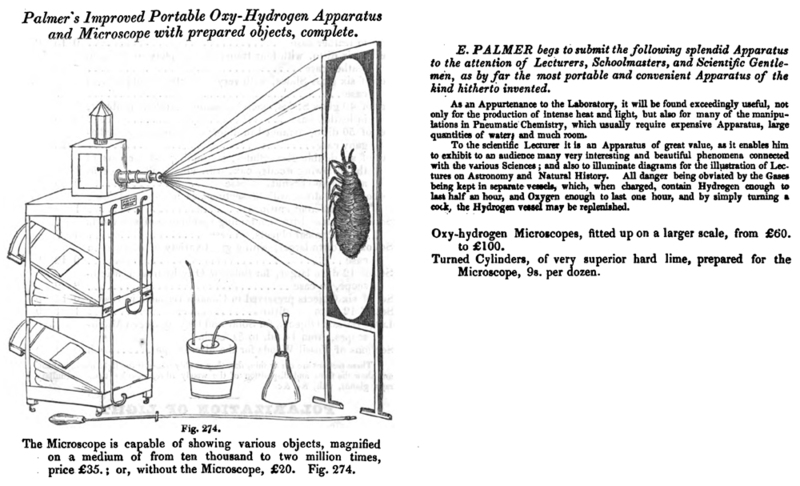 Palmer’s catalog provides important insights into what sorts of microscopes and other items were available to scientifically inclined Englishmen during the early Victorian era. Figure 1. Cover of Edward Palmer’s 1840 catalog. Figure 2. (A) The first page of microscopes listed in Palmer’s catalog, all of the type designed by Charles Gould. The inclusion of Gould’s name here suggests that he was the actual maker of these instruments. Gould was working for William Cary in the mid-1820s when he designed the type of microscope labeled ‘Fig. 254’, and these types of microscopes are often called “Cary”. 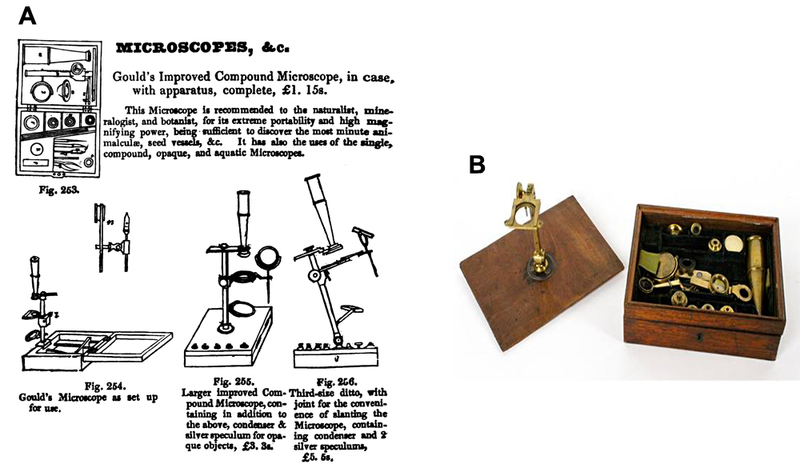 Palmer’s catalog indicates that, by 1840, one could purchase the original Gould-type microscope, in which the microscope mounted to the inside of the box (fig. 254), or larger microscopes that mounted to the center of the wooden box, without or with a hinge for tilting the instrument (figs. 255 and 256, respectively). William Cary died in 1825, and, although Cary’s nephews inherited the business, Gould managed the operation. In ‘The Great Age of the Microscope’, G. Turner hypothesized that a single factory may have produced many or all Gould-style microscopes – Palmer’s catalog suggests that this may have been the Cary-Gould enterprise. Gould’s book, ‘Companion to the Microscope’, was written to accompany his microscopes. Palmer’s figures 253 and 254 were adapted from illustrations in Gould’s book. (B) A Gould-style microscope engraved ‘Edward Palmer’, sold in 2010 by Bonham’s auctioneers. This is a “third-size” microscope with a joint, as illustrated by Palmer in his figure 256. Figure 3. The other microscopes offered in Palmer’s catalog, ranging from single-lens magnifiers to complex compound microscopes. Note that the ‘extra-large very superior microscope’ cost £35, placing it well beyond the reach of the vast majority of people in 1840. Figure 4. The list of microscope slides offered by Palmer in 1840. The photograph shows examples that correspond with Palmer’s descriptions (please note that there are no indications that any of these examples was retailed by Palmer). Left to right: ivory slide with four opaque objects, ivory slide with four transparent objects, double glass slide containing three sections of elm wood, two double glass slides containing three each sections of wood, double glass slide containing botanical objects (sarsaparilla), and a slide of sections of fossil wood. The double glass slides, sealed with red wax, are nowadays often attributed to Andrew Pritchard because he described their production in a 1847 book, and because such slides are occasionally found with Pritchard’s name attached. However, there is no evidence that Pritchard actually made any of these slides, nor that he was the only retailer to have sold them. John Quekett, in his ‘Treatise on the Use of the Microscope’ stated that these slides were made by William Darker. A detailed biography of William Darker and his extensive involvement with early microscopy and optics is currently under production. Figure 5. 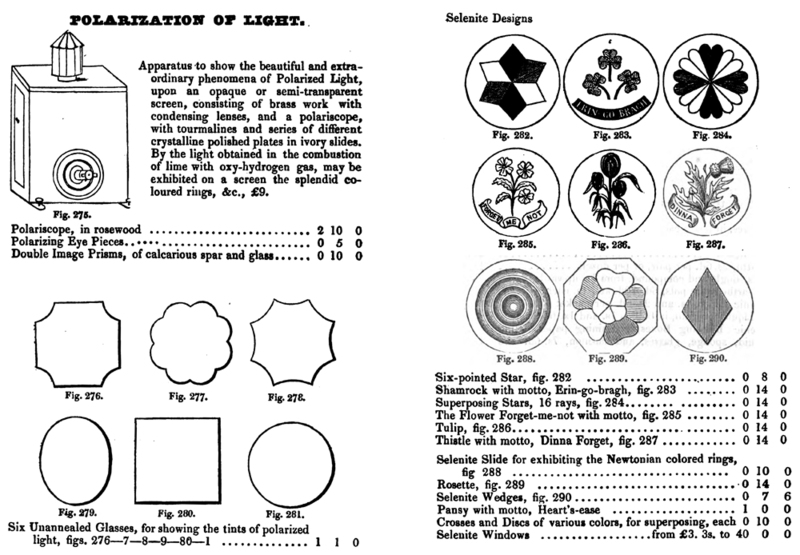 Palmer’s offerings for the study and enjoyment of the effects of polarized light. All of these items may have been produced by William Darker, who was renowned for his polarizing and projecting microscopes, and “a great variety of devices prepared with films of selenite of different thicknesses, and which constitute philosophical toys .. Gothic windows, stars, flowers, fruits, animals (butterflies, parrots, dolphins and chameleons), and theatrical figures (Jim Crow, harlequin, &c.), are some of the ingenious, and often laughable illustrations contrived by Mr. Darker” (Pereira). Figure 6. 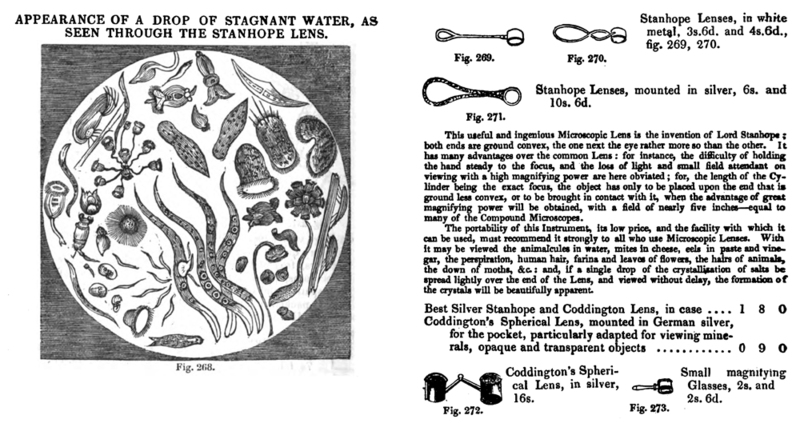 Stanhope and other small magnifying glasses offered by Palmer. Figure 7. Projection microscopes offered by Edward Palmer. These burned hydrogen gas in the presence of pure oxygen, which produces a very intense light. Figure 8. 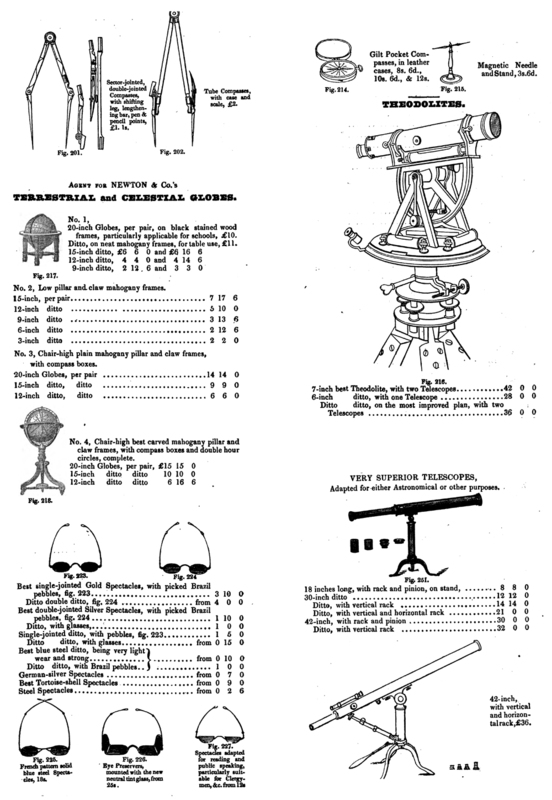 Some other types of items offered in the 1840 Palmer catalog. A wide variety of instruments, chemicals, etc. were sold to meet virtually every scientific or engineering need. Figure 9. Further items available from Edward Palmer. Edward Palmer was born July 1, 1803, in the parish of St. Bartholomew-by-the-Exchange, Middlesex (London). He was the eldest child of Edward and Elizabeth Palmer. The father was a wholesale druggist and chemist, and partner in the firm of Fynmore and Palmer of 62 Aldersgate Street, and later of 31 Throgmorton Street, London. At some point, Edward moved south, across the Thames, to Southwark. He lived in the parish of St Olave Southwark during 1828, when he married Jemima Closs Law. The 1830 christening record of their only child, also named Jemima, reported that the Palmers then lived in St. Giles Southwark. The christening record also stated that Edward worked as a “chemist”, a trade that he presumably learned from his father. Later records indicate that Palmer was skilled at fine machine work, although it is not known where he acquired that art. 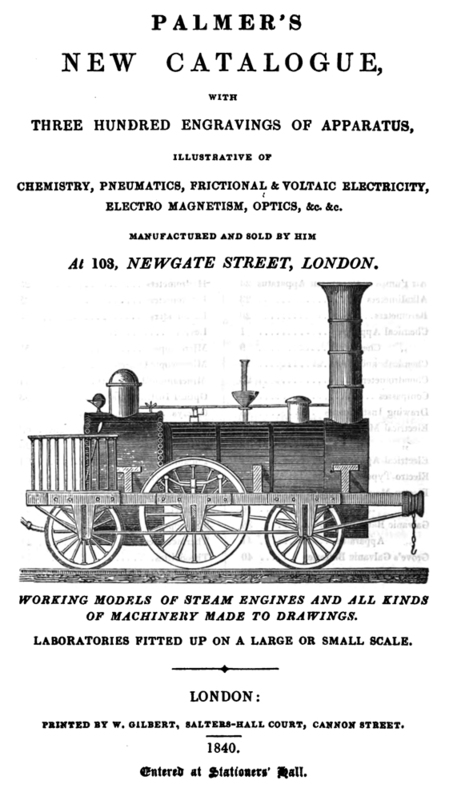 In 1837, Palmer had established a business at 103 Newgate St., London, dealing in “Chemical and Philosophical Apparatus, Microscopes, &c.” (Figure 10A). 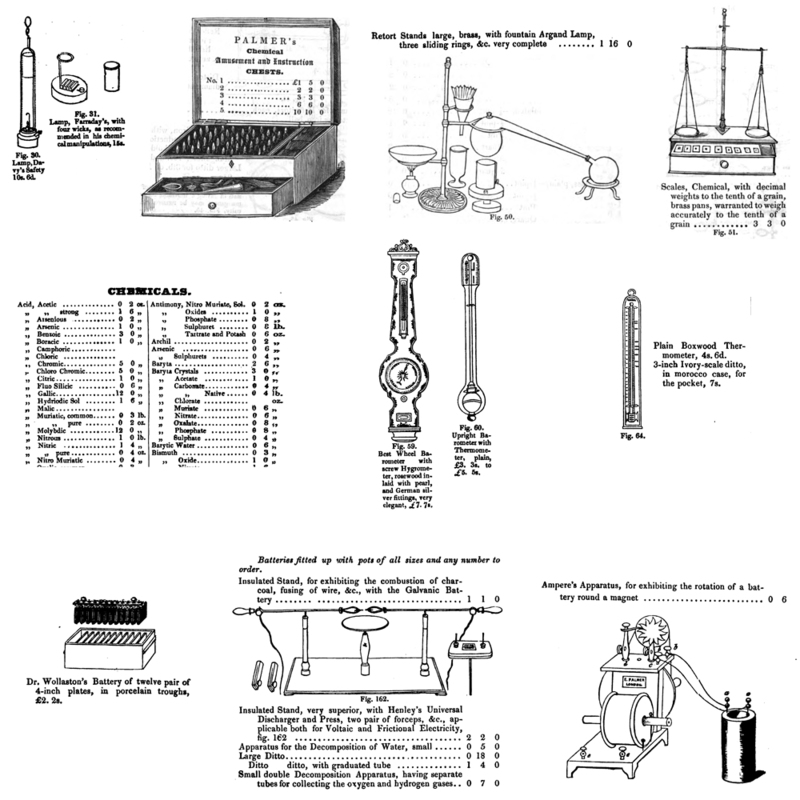 Electrical and magnetic devices sold by Palmer (Figure 10B) were probably made by him. A series of advertisements that appeared in the 1839 Athenaeum promoted “pneumatic filtering machines”, whereby one could filter and concentrate “liqueurs, wines, essences, &c. with a rapidity perfectly astonishing. The concentrated essence of coffee, produced by this unequalled process, surpasses anything of the kind in flavour”. Figure 10. 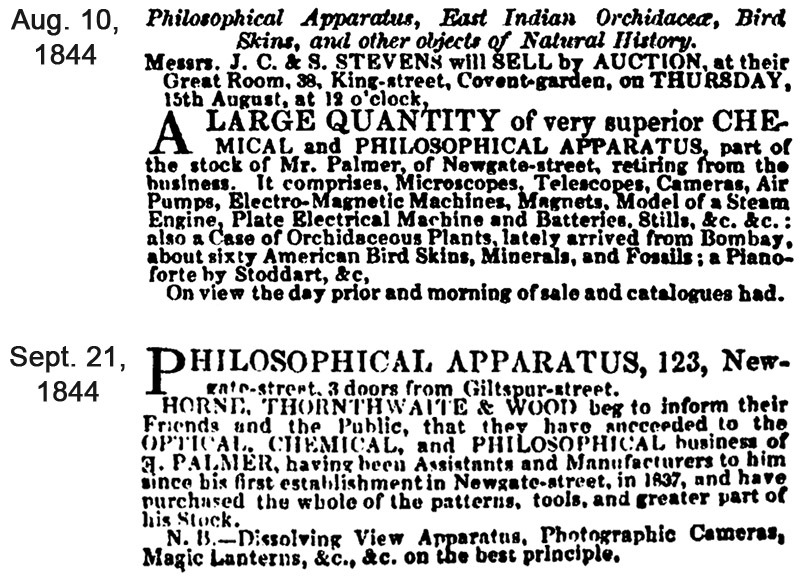 Advertisements from Edward Palmer that appeared in (A) ‘The Literary Gazette”, December 15, 1837, (B) ‘Arcana of Science and Art’, published early 1838, and (C) ‘The Edinburgh Review’, April, 1840. 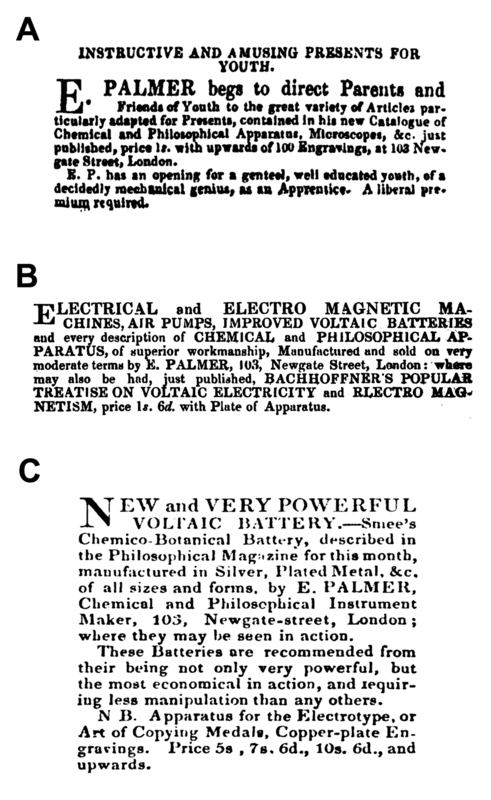 Note that Palmer also advertised in 1837 for an apprentice. The 1841 census recorded the Palmers sharing their home on Newgate with 15 year-old “shop boy” William Bolton. He is probably the same person who later operated his own photographic supply shop in London. In 1841, 103 Newgate was also home to “chemical and philosophical instrument makers” William Thornthwaite and Thomas Willatts, both approximately 20 years old (the 1841 census rounded off ages to 5 or 10 years) and who probably had also apprenticed with Palmer. On June 12, 1841, “Edward Palmer, of Newgate-street, gentleman”, was awarded a patent for “improvements in producing printing surfaces, and in the printing china, pottery, ware, music, maps, and portraits”. These were advances in electroplating/electrotyping, and is indicative of Palmer’s skills in engineering and electronics. He elaborated on this in the following 1840 advertisement, “ELECTROTYPE; or, the Art of Procuring, in the most simple manner, by means of Galvanic Action, perfect Facsimiles of engraved Copper-plates of all sizes, even of the most elaborate workmanship; also correct copies of Medals, and all kinds of Metallic Ornaments; specimens of which may be seen, and the Apparatus had, of all sizes, of E. PALMER, Philosophical Instrument Maker, 103, Newgate-street, London. Prices 5s., 7s. 6d., 10s. 6d., and upwards”. The figures for Palmer’s 1840 catalog were probably made by this method, as indicated by another 1840 ad, “THREE HUNDRED ENGRAVINGS of Apparatus illustrative of Chemistry, Pneumatics, Friction, and Voltaic Electro-Magnetism, Optics, &c. &c, embracing many new and valuable instruments of research and amusement, are now publishing by E. PALMER, 103, Newgate-street., London, in his new printed Catalogue for 1840. Price 1s. 6d., to be had of all Booksellers”. In August, 1844, Palmer closed his business and sold off his stock (Figure 11). The bulk of his goods was acquired by Fallon Horne, William Henry Thornthwaite, and Edward George Wood, all of whom described themselves as long-term employees and suppliers (Figure 11). Thornthwaite was the author of Photographic Manipulation (described in the preceding paragraph), which was one of the first books to be published on photography. The first edition was published by Palmer in 1843 without naming the author. The second edition, also published by Palmer in 1843, gave authorship credit to Thornthwaite. The company of Horne, Thornthwaite, and Wood (later Horne and Thornthwaite) produced microscopes, photographic equipment, and other optical apparatus and supplies until 1911. Edward Palmer was only 42 when he sold the business at 103 Newgate. For the 1851 census, he described his occupation as being an “auctioneer and estate agent”, with he, Jemima, and their daughter living in Clerkenwell, Middlesex. In 1861, Edward was a “commercial traveller” (traveling salesman), and he and his wife lived in Islington, Middlesex. Edward and Jemima were retired on annuities by 1871, and lived with their daughter, her husband, and their 6 children in Leeds, Yorkshire. Edward Palmer died in Leeds late in 1872, at the age of 69. Figure 11. Advertisements from 1844 issues of The Athenaeum. The August 10 advertisement announced the auctioning-off of Edward Palmer's goods, while the September 21 advertisement announced the opening of Horne, Thornthwaite, and Wood, as successors to Palmer. My thanks to Julie Clulow for sharing information on Palmer’s early life, and to Howard Lynk for our ongoing, productive conversations on historical microscopy.